“We made a joke in an interview about our salaries which was taken out of context,” the actresses said in a statement to TheWrap. In May, the actresses revealed during a press event for the comedy that they found out they were making the same salary as their male co-stars Martin Sheen and Sam Waterston — even though the two women are the leads on the show, with their characters’ names in the title, and their co-stars are supporting players. “That doesn’t make us happy,” Fonda said at the time. “No. 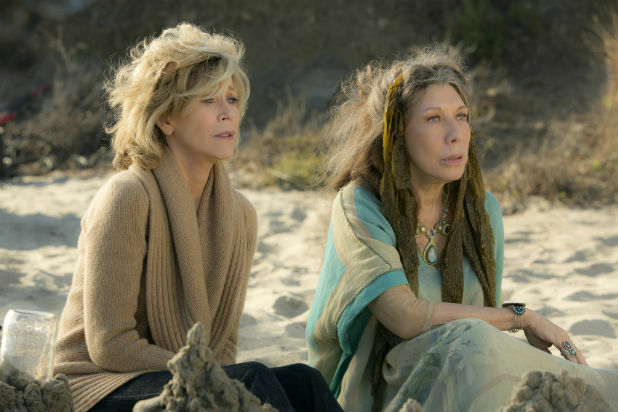 The show is not ‘Sol and Robert’ — it’s ‘Grace and Frankie,'” Tomlin added. “Grace and Frankie,” which also stars Brooklyn Decker, Ethan Embry, Baron Vaughn and June Diane Raphael, has already been renewed for a second season. The show is produced by Skydance Television for Netflix. Executive producers for the series are Kauffman (through her company Okay Goodnight), Morris, Paula Weinstein, David Ellison, Dana Goldberg, Marcy Ross, as well as Fonda and Tomlin.